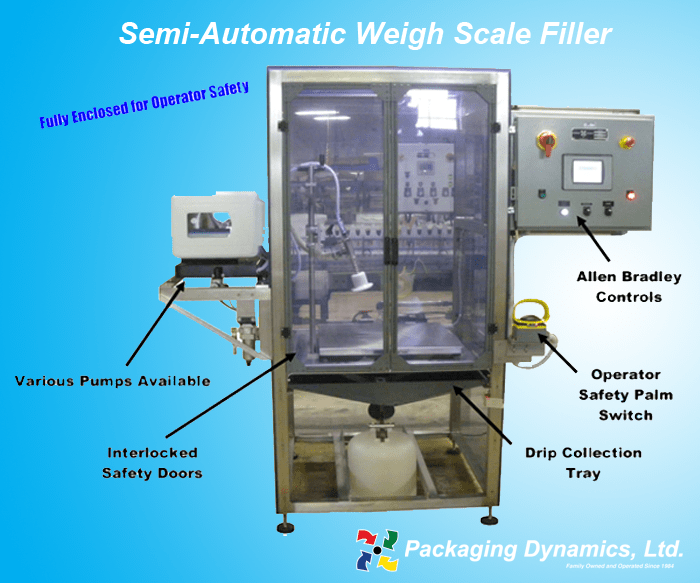 Semi-Automatic Weigh Scale Filler - Packaging Dynamics, Ltd.
Packaging Dynamics Ltd. introduces the Semi-Automatic Weigh Scale Filler (SLA-WS1) which utilizes Hardy weigh scale technology to achieve high accuracy. This filler offers either single or dual head models which handle various viscosities from water thin to thick paste. The SLA-WS1 is fully enclosed for operator safety and a variety of safety options are available to fit every customers needs. The Stainless Steel construction makes cleaning and maintenance easy with little to no set up costs. Custom Accumulation tables and indexing conveyors are available for your needs.